The graphic novel debut from rising star Noelle Stevenson, based on her beloved and critically acclaimed web comic, which Slate awarded its Cartoonist Studio Prize, calling it "a deadpan epic." Nemeses! Dragons! Science! Symbolism! All these and more await in this brilliantly subversive, sharply irreverent epic from Noelle Stevenson. Featuring an exclusive epilogue not seen in the web comic, along with bonus conceptual sketches and revised pages throughout, this gorgeous full-color graphic novel is perfect for the legions of fans of the web comic and is sure to win Noelle many new ones. Nimona is an impulsive young shapeshifter with a knack for villainy. Lord Ballister Blackheart is a villain with a vendetta. As sidekick and supervillain, Nimona and Lord Blackheart are about to wreak some serious havoc. Their mission: prove to the kingdom that Sir Ambrosius Goldenloin and his buddies at the Institution of Law Enforcement and Heroics aren't the heroes everyone thinks they are. 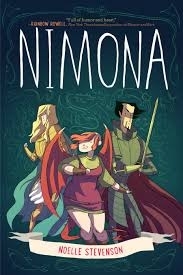 But as small acts of mischief escalate into a vicious battle, Lord Blackheart realizes that Nimona's powers are as murky and mysterious as her past. And her unpredictable wild side might be more dangerous than he is willing to admit. I'm gonna start this review off extremely honest; I have NO idea why I put off reading this for so long. I've seen a few good things about it which caused me to buy the book from Barnes and Noble a few months ago and just never thought to just take a little peek into what I'd be getting myself into. I don't read too many graphic novels or comics (unless it deals with Deadpool), but every now and then, there's one that draws me in like this one did. Again, upon picking up this book to actually read, I didn't know what to expect, and after reading the first chapter, I was completely hooked. To me, the style of the characters, the humor, the scenes.... they kind of remind me of Adventure Time and that's what made it even better for me. Even though it's a graphic novel, leaving little room for character development and limiting the connections made to the characters, the author does an amazing job to make it a solid story with believable, entertaining characters. It's also really nice to be able to follow characters who are considered to be on the other side of the playing field (you know, not necessarily the heroes), which made it even more of a joy to read. The author, Ms. Stevenson, really knows how to make you feel in the story; she forms connections with characters and because it all comes off so natural, it's believable enough to make you empathize with the characters during the story. I have to admit, I really did tear up at the end. Speaking of ends, this one left me both loving and hating it -- I'd say it was a bittersweet ending. All in all, this was a really good, entertaining, and fast read for me. It's refreshing to read something like this and because of how much I enjoyed it, I will be looking into Ms. Stevenson's other works.